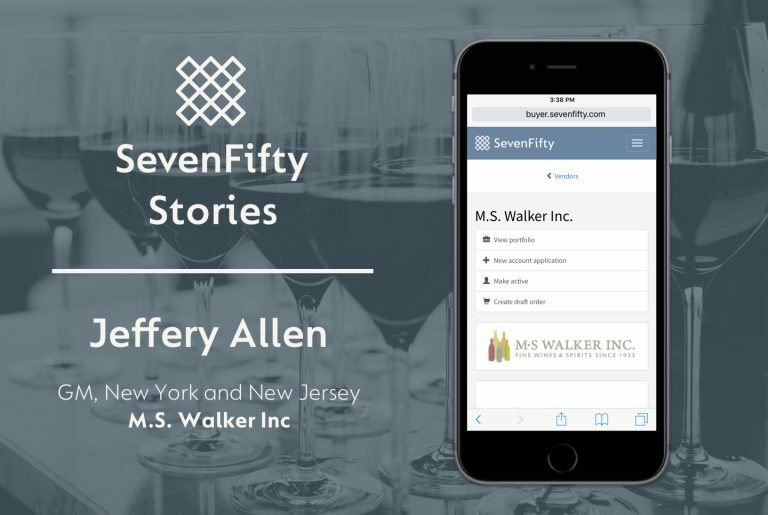 Welcome to SevenFifty Stories — where beverage industry professionals share how they’ve used SevenFifty to make their lives easier. Jeffery Allen is the General Manager of M.S. Walker in New York and New Jersey and has been using SevenFifty for over three years. Buyers in New York and New Jersey on SevenFifty can view M.S. Walker’s portfolio of over 1400 products here. SevenFifty: Tell us a little bit about M.S. Walker. Jeffery Allen: M.S. Walker is a fifth generation family-owned business that was started in New England, specifically Boston, in 1933. Since then, we’ve expanded into several markets within the Northeast, including wholesale operations in Rhode Island, New York, New Jersey, Massachusetts, and New Hampshire. The company began as a rectifier and a bottler. We are a wine and spirits wholesaler as well as a national supplier and importer. We service, all-in-all, 46 states in the US. What effect has technology had on the landscape (if any) in the last several years? The visibility that our customers have into what’s available, our sales team’s ability to manage their business in a more efficient, effective manner. This transparency helps us service our customers and helps our sales folks do their jobs in a more comprehensive manner. 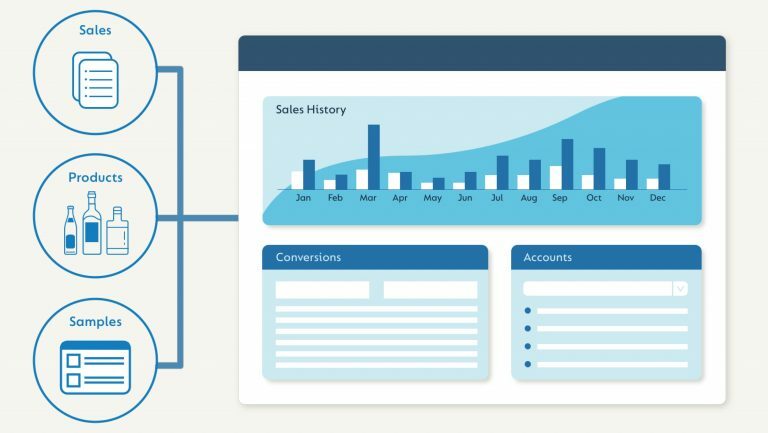 You say technology has helped your sales team be more efficient and effective. How do you make sure they stand out in a competitive market? Education is the most important thing — making sure our team is fully armed with all the available information and tools and understand how to leverage them to get the right information to their customers who, in this market, are thirsty for information about producers, about place, about products and the stories and people behind them. How has SevenFifty fit into that equation? SevenFifty is a part of our day-to-day operations in many different ways. Our reps use SevenFifty to create their price sheets. They use it as an organizational tool. They use it as a tool to share product knowledge with their customers. 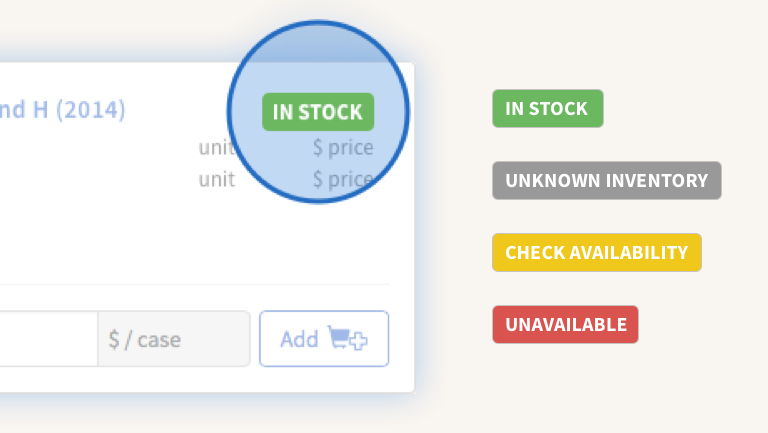 They use it to grab quick information about the specific product. Of course, to your point of the marketplace being so dynamic and with such a large offering: We’re the beneficiaries. One of the things I like most about SevenFifty is it’s a connection point to customers even if they’re not yet customers of ours. Do you mean that buyers are submitting credit applications and connecting to M.S. Walker through SevenFifty? Customers hand in completed credit applications to us through SevenFifty all the time. We’ve gotten 435 in New York so far. It’s an amazing testament, to your platform, to our portfolio, and most importantly to the market’s interest in having a diverse and complete offering, because I’m sure we’re not the only wholesalers benefiting from that facet. Some distributors may think of SevenFifty as a tool that replaces work that reps should be doing, but in fact what we hear all the time is that SevenFifty helps improve the relationship that reps have with their buyers. 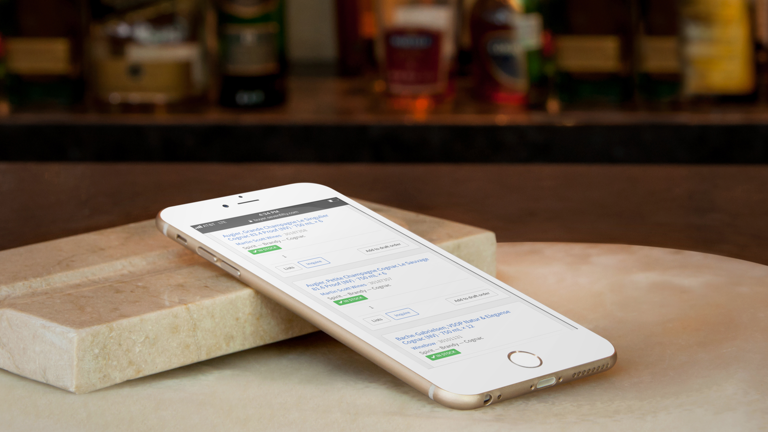 How has using SevenFifty improved your reps’ relationships with their accounts? I think, again, it goes to transparency, the ability to see what was sampled, the type of content that’s on the site, from label shots to technical information, the ability to tag samples and share the list of what’s been tasted with that customer, then of course, as an organizational tool, to follow up with what’s been presented to the customer. If you were speaking to someone who doesn’t understand how SevenFifty works, can you explain how your reps use SevenFifty to tailor what to bring to an individual account? There are a few different ways. Number one, they can build out a sample sheet of wines and spirits that they’re tasting that day. They can build that sheet out for the account and they can build it out for the day. 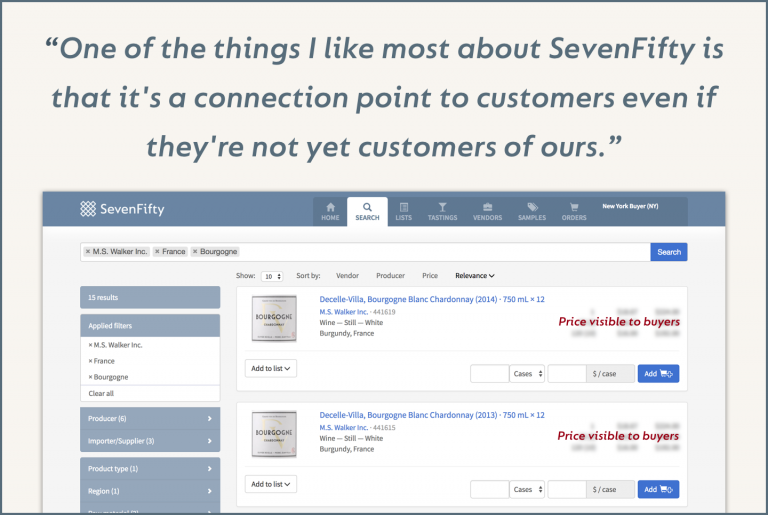 If they know that they’re trying to achieve a price point on region and a varietal for an account, they can use SevenFifty as a search tool to help build out their plan. It depends on the rep’s game plan for the day and how they approach their business. We don’t say, “This is the way that you have to work with it and build out your plan.” We allow them the freedom to use the tool as they see fit. 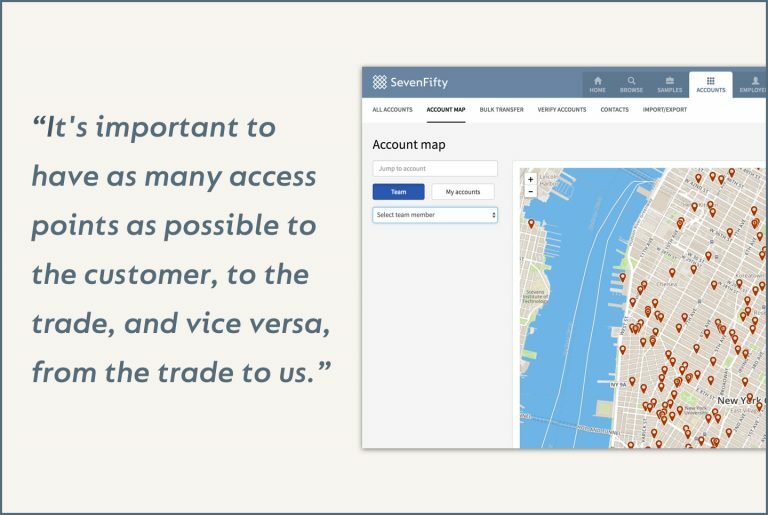 It’s our job to educate them on how to use SevenFifty, and it’s their job to know what makes the most sense for their customers and the portfolio. From a philosophical standpoint, once you have good tools and the right people, what’s the most important part of maintaining great relationships with your customers? Boy, that’s a good one. Trust. Follow-up. The one thing that hasn’t changed is doing what you say you’re going to do, following through on your word, being honest and honorable. It’s still very much a relationship building business, so having strong relationships between the salesperson, the sales manager, and the customer is still the most important foundation for us, as it was when my grandfather’s generation was building the business. In that respect, regardless of technology, that’s our guiding principle: Service, service, service. That hasn’t wavered. 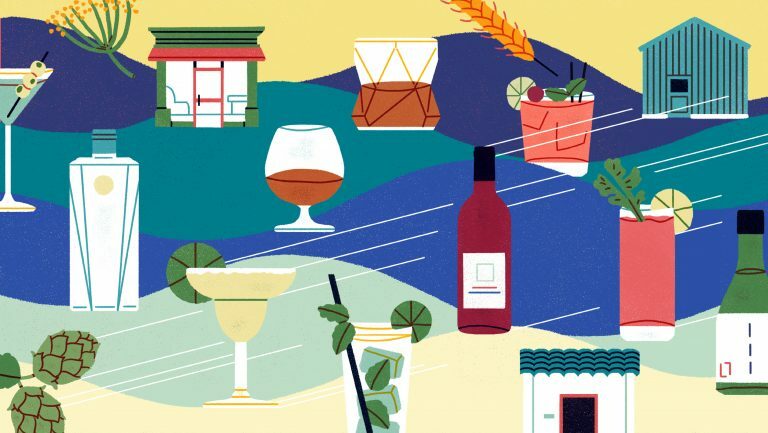 What advice would you give a distributor reading this to figure out when is the right time to adopt SevenFifty? That decision ultimately lies within each entity and what they feel is best for their business. Everyone has their own strategy. For us in our business, it’s important to have as many access points as possible to the customer, to the trade, and vice versa, from the trade to us. 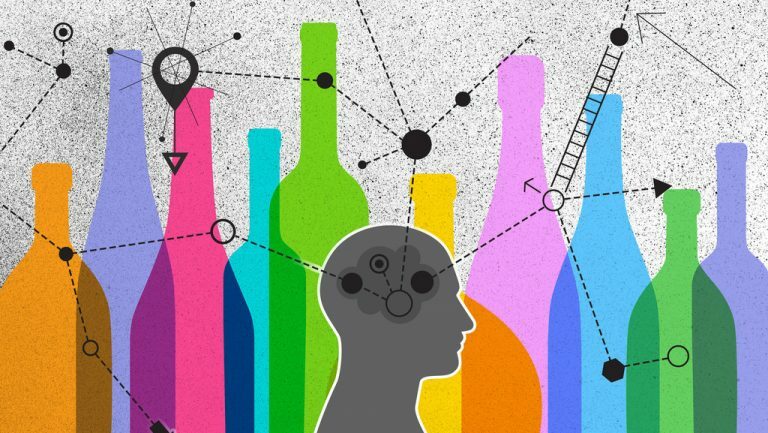 If you value an open and honest relationship between wholesale partner, importer, and on-premise or off-premise accounts like we do, then I think it’s a no-brainer. Are you interested in learning how using SevenFifty can save you time and money? Click here and sign up today.